ORIENTATION: Stress is a social reality which does not exist in isolation, but in many social situations, especially work-related environments. Police officers in particular suffer from highly negative stress related outcomes. RESEARCH PURPOSE: The purpose of the study was to determine how Moos's hypothesised stress and coping model (1994) fitted a sample of police officers. MOTIVATION FOR THE STUDY: The study was an attempt to understand police officers' unique needs and how the frequency and/or intensity of perceived stress could be reduced so that they would be able to cope more effectively with stress. RESEARCH DESIGN, APPROACH AND METHOD: A non-experimental survey design, following the quantitative tradition, was used in pursuit of the research objectives. A random sample of 505 participants was extracted from a population of serving male and female police officers reflecting the typical South African ethnic groups. Structural equation modelling (SEM) was used to establish the adequacy of between the hypothesised Moos model and the sample. MAIN FINDINGS: The hypothesised theoretical framework was disproved. A respecified model and inter-correlations confirm that some officers experience burnout, while, paradoxically, others continue to be unaffected because of the buffering effect of social support, personality factors and other resilience factors not revealed in this study. PRACTICAL/MANAGERIAL IMPLICATIONS: The study calls on police management for awareness of the negative health consequences of prolonged stressors. Simultaneously, employee assistance programmes could be directed to problem-solving strategies, perceived self-efficacy and learned resourcefulness to improve control over prolonged negative stress consequences among members. CONTRIBUTION/VALUE-ADD: This research provides a theoretical framework to understand, describe and assess individual well-being in the police work context. Researchers describe police work as one of society's most stressful occupations (Alexander, 1999; Anshel, 2000; Paton & Violanti, 1999). Police officers in the South African Police Service (SAPS), where the socio-economic and political turmoil of the past three decades has been characterised by extreme levels of crime and violence, are similarly exposed to stressful situations (Gulle, Tredoux & Foster, 1998; Mostert & Joubert, 2005). In addition, more and more individuals serving in the service delivery professions experience burnout and other symptoms as a result of prolonged stress (Dorz, Novara, Sica & Sanavio, 2005; Friedman, 2000). Police officers are not different from individuals in other professions who are suffering from negative stress related outcomes (Mostert & Joubert, 2005). Eventually, such affected individuals find it extremely difficult to effectively cope with daily activities and, in some instances, suffering from symptoms like depression, psychosomatic disturbances and cardiac dysfunction, to name but a few. Paradoxically, other co-workers exposed to the same circumstances and conditions reflect a vigorous and energetic life - a phenomenon which stress and coping theorists often do not consider researching. Most studies dealing with police officers have been conducted in the United States of America and Europe and are not necessarily applicable in all aspects to other countries. Such studies focused on the stress phenomenon, while ignoring stress resistance factors (Berg, Hem, Lau, Håseth & Ekeberg, 2005; Hart, Wearing & Heady, 1995). Local studies conducted with police samples have mainly focused on the North-West Province, because of a special interest in stress-related outcomes in the particular region (Pienaar & Rothmann, 2003; Rothmann & Jorgensen, 2007; Storm & Rothmann, 2003). While models are available in occupational and organisational psychology literature (Cooper, 1998 for an overview), it is widely acknowledged that police work involves unique sources of stress and a variety of coping strategies, especially on social support, to deal with their unique stressful circumstances (Anshel, 2000; Patterson, 2003). Mainstream organisational stress models, such as the Job-Demands Resources model and the Comprehensive Burnout and Engagement model (COBE), suggest that a stress outcome, such as burnout, is mainly predicted by job demands and the lack of resources. In the same vein, engagement is exclusively predicted by the availability of resources (Bakker, Demerouti & Verbeke, 2004; Rothmann & Jorgensen, 2007; Shaufeli & Bakker, 2004). There is an apparent absence of literature or models in a work context that provide conceptual links between each stage in the coping process. A further limitation of the aforementioned models is that psychosocial resources are conceptualised as static (Holahan, Moos, Holahan & Cronkite, 1999). In models where such resources are included in conceptual frameworks, it is limited to an individual's interaction with support structures within the work context. Conversely, police officers are typical citizens in that they tend to have spouses, partners, children or friends that can be resources for social support, or a buffer against work stress. A conceptual model explaining the coping process in police context could be an important component in the effort to understand an officer's need to reduce the frequency and/or intensity of perceived stress so that he/she can cope more effectively. Lazarus (1990) asserts that the coping process cannot be understood in the absence of identifying cognitive appraisal and the most effective coping strategies. In addition, coping resources are: properties of individuals (e.g. personality traits), their social environment (e.g. social support) and physical environmental resources (e.g. privacy) that enable them to respond to stressors. Which coping responses emerge is determined partly by people's knowledge of coping options and partly by their beliefs about the usefulness of those options. If Lazarus (1990) can be rephrased in the context of the environment in which police officers find themselves, an understanding of police stress must take into account appraisal and coping processes, each of which has implications for effective stress management techniques. If one wants to understand the stress and coping process to implement preventative measures, a suitable research model that proposes coping as an integral part of the interaction between psychological, environmental and biological factors and psychological well-being, is needed. The Moos model is probably the most comprehensive theoretical framework to explain the dynamic interaction within the stress and coping process, as well as the individual's perceived controllability in terms of personal and social resources to maintain physical and mental health in such a process. This model was derived from the above view of Lazarus (1990) and Lazarus and Folkman's (1984) transactional postulate of the stress and coping process that was founded on Antonovsky (1987) and Kobasa's (1979) stress resistance research. 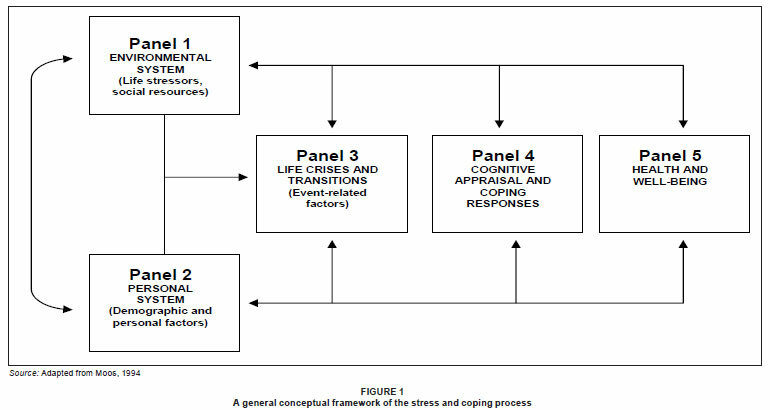 Figure 1 is a schematic representation of Moos's model and can be explained as follows: The environmental system (Panel 1) is composed of ongoing life stressors, like chronic physical illness, as well as social coping resources, such as support from family members. The personal system (Panel 2) includes an individual's socio-demographic characteristics and personal coping resources, such as self-confidence. These relatively stable environmental and personal factors influence the life crises and transitions that individuals face (Panel 3), which reflect significant changes in life circumstances. In turn, these combined influences, shape health and well-being (Panel 5), both directly and indirectly, through cognitive appraisal and coping responses (Panel 4). The framework emphasises the central mediating role of cognitive appraisal and coping responses in the stress process (Du Toit, 1999; Holahan & Moos, 1991). The reciprocal interaction between every phase in the model is indicated by the arrows in the schematic representation. Despite the fact that the coping underpinnings of the Moos model reverts to the intense coping debate that took place in the 1980s and 1990s, coping as a concept has become a natural part of the landscape of psychology. However, in the context of organisational psychology, coping is almost overridden by organisational factors that are emphasised in the stress theories and models discussed earlier. It seems that the Moos model would provide a comprehensive framework to a global understanding of the stress and coping process, as well as the management of such symptoms in the police context. No studies could be found in which the full Moos model was subject to a statistical global fit analysis (personal communication, R.H. Moos, November 7, 2007). However, some studies were found in which Moos and his colleagues have examined specific portions of the overall model (Holahan & Moos, 1991; Holahan, Moos, Holahan & Brennan, 1995, 1997; Holahan et al., 1999). Instead of examining the model for global fit, all cases were focused on a local fit of the model. Fit evaluations in all these cases produced adequate fit between samples and the model. The researcher came across one local study (Du Toit, 1999) in which a global fit of the Moos model was evaluated in terms of a student sample. However, because of the difference in sample characteristics (e.g. students) it could not be compared with samples in the police context. The objective of this study was, therefore, to examine adequacy of fit between the Moos hypothesised stress and coping theoretical framework and a police sample. Model fit information would unveil the possible buffering effects of personality, social support and coping strategies on psychological well-being during the stress and coping process. Such information would be valuable in understanding the stress and coping dynamics in order to assess how police stress could be managed proactively. The Moos model consists of a system of relationships between different components. These components, representing the model, are open to numerous definitions and, as such, the model needs to be operationalised in terms of the constructs which are specifically relevant to this study. McCreary and Thompson (2006) describe police stress as an individual's response to daily frustration and demands (chronic stressors) in the police work environment. They view police stress as different from other occupations and distinguish between organisational stress (emanating from interaction with the organisational system and co-workers) and operational stress (emanating from interaction with the community and the extra-mural work environment). Prolonged stressors from the former are usually responsible for stress outcomes such as burnout, depression, cardiac disturbances and the like. Police stress identifies with Panel 1 in the Moos model. Zimet, Dahlem, Zimet and Farley (1988) define perceived social support as an individual's perception of how resources can act as a buffer between stressful events and symptoms. According to Zimet et al. (1988), perceived social support consists of three dimensions, namely family, friends and significant other. Whereas family and friends are self-explanatory, a significant other could be a supervisor, peer, co-worker or any other person not explicitly defined, but with whom the individual has contact on a daily basis. Perceived social support identifies with Panel 1 in the Moos model. According to research (Costa & McCrae, 2000; Goldberg, 1992), the Five Factor model of personality is regarded as the most comprehensive taxonomy of personality in the work context. These authors view personality as a system defined by personality traits and dynamic processes by which they affect the individual's functioning. Personality identifies with Panel 2 in the Moos model. An exact definition of a coping strategy is hard to find. It springs partly from the mental sets brought by an individual to a stressful event, and serves as an option one chooses in accordance with its perceived usefulness to respond to a stressor, or potential stressor (Carver, Scheier & Weintraub, 1989; Zeidner & Endler, 1996). A coping strategy can be either to approach or to avoid the particular stressor. Some strategies may be more useful than others. Coping strategies identify with Panel 4 of the Moos model. According to Van Horn, Taris, Schaufeli and Scheurs (2004), occupational well-being can be construed as a multidimensional phenomenon and affective well-being appears to be the most central aspect of occupational well-being. By reason of its multidimensionality, affective well-being can be viewed in terms of a bivariate relationship between two extremes called 'vigour and burnout' (Shirom, 2003a, 2003b). Such a view coincides with a pathogenic, as well as a salutogenic, health outcome (see Rothmann, 2003; Strümpfer, 2002), which begs the question why some police officers suffer from burnout, while others find pleasure in work under similar circumstances and conditions. Well-being identifies with Panel 5 of the Moos model. Considering the above arguments, well-being is demarcated into vigour and burnout for the purposes of this study. Vigour: Vigour represents a positive affective response to one's ongoing interaction with significant elements in one's job and work environment, which comprises the interconnected feelings of physical strength, emotional energy and cognitive liveliness (Shirom, 2003a, 2003b). Vigour reflects high levels of energy, accompanied by a motivation to put in an effort at work and be resilient, able to withstand difficulties and persist, despite obstacles. The construct represents a positive affective response to one's ongoing interactions with significant elements in one's job and work environment. The concept of vigour is derived from Hobfoll's (1998) Conservation of Resources theory (COR), which central tenets are that people have a basic motivation to obtain, retain and protect that which they value. Burnout: Burnout is viewed by Shirom (2003a) as an affective reaction to ongoing stress, whose core content is the gradual depletion over time of an individual's intrinsic energetic resources, resulting in the expression of emotional exhaustion, physical fatigue and cognitive weariness. Furthermore, it is a state that manifests when individuals experience a cycle of resource losses over a period of time at work. Life crises and transitions identify with Panel 3 of Moos's model and are beyond the scope of this study. Therefore Panel 3 is excluded. There exists a good fit between the hypothesised Moos stress and coping model and the empirical sample. A non-experimental design and survey data collection method was used in pursuit of the research objectives. The specific design used was a cross-sectional survey design, where a sample was collected at one point in time (Shaughnessy & Zechmeister, 1997). The participants were employees of the SAPS stationed in the Provinces of the Eastern and the Western Cape, who attended in-service training sessions at the respective provincial training centres. Random samples (n = 505) were taken from selected officers who had a minimum of one year's service completed. Questionnaires were used to collect the data. A total of 520 officers attended courses at the respective training centres. Nine of these officers were either sick or unavailable for survey purposes. Questionnaires were handed out to 511 officers, of which 505 (98%) were returned. The main ethnic groups (African, White, Coloured and Indian) representing the South African society, were included in the sample. The sample was representative of both gender groups. The sample consisted mostly of men (69.30%), of which 32.28% indicated that they were single (never married before), 61.78% were married, while 5.94% were divorced. Black officers were in the majority (50.89%), followed by Whites (34.46%), while Coloureds and Indians were in minority (12.48% and 2.17% respectively). The police ranks represented in the sample were Constables (28.72%), Sergeants (14.05%), Inspectors (23.37%) and Captain to Superintendent (33.86%). Organisational police stress questionnaire: The organisational police stress questionnaire (OPSQ) (McCreary & Thompson, 2006) is a 20-item instrument which was used to measure police stress. The OPSQ is a seven-point intensity scale ranging from 1 ('No stress at all') to 7 ('A lot of stress'). An intensity of 4 represents 'Moderate stress' on the scale. Descriptive statistics of the OPSQ are displayed in Table 1. The paper-and-pencil questionnaire is in a statement and self-administered format. An exploratory factor analysis, with principal component analysis and an orthogonal varimax rotation was implemented to simplify factors for the envisaged prediction technique used in this research. Four underlying factors, namely, job demands, uncertainty, work overload and frustration were identified. McCreary and Thompson (2006) report high scale reliability (α > 0.90). Multidimensional scale of perceived social support: The multidimensional scale of perceived social support (MSPSS) (Zimet et al., 1988) is a self-report instrument and was used to measure perceived social support. The MSPSS has 12 items with an intensity scale ranging from 1 ('very strongly disagree') to 7 ('very strongly agree'). Descriptive statistics of the MSPSS are displayed in Table 1. The paper-and-pencil questionnaire is in a statement and self-administered format. Zimet et al. report internal consistencies of 0.90, 0.87 and 0.85, respectively for the three subscales Significant Other, Family and Friends. Five Factor inventory: The Five Factor inventory (Goldberg, 1992) was used to measure personality in terms of the Five Factor model which provides a unifying personality framework that is useful in the prediction of job performance in some occupations (Costa & McCrae, 2000; Robbins, 2003). It is based on an abbreviated structure of personality for research purposes, especially in a case of long protocols (Goldberg, 1992). Descriptive statistics of the Five Factor inventory are displayed in Table 1. The inventory is a self-report paper-and-pencil instrument with five subscales. Each dimension includes a collection of bipolar rating scales. The instrument is a 9-point intensity scale on which individuals indicate whether they 'very' much agree, 'moderately' or 'do not' agree with an abbreviated statement that describes his or her personality traits on either side of each facet of a subscale. In total, the questionnaire consists of 25 abbreviated statements. The five broad dimensions (subscales) identified by Goldberg (1992) were: introversion versus extraversion; antagonism versus agreeableness; lack of direction versus conscientiousness; emotional stability versus neuroticism; and closedness versus openness to new experience. The subscales of the Five Factor structure proposed by Goldberg (1992) were established through a process of three consecutive studies conducted by the developer. Factor correlations are reported for each dimension. The correlation of introversion versus extraversion is 0.97; of antagonism versus agreeableness 0.93; of lack of direction versus conscientiousness 0.95; of emotional stability versus neuroticism 0.97 and of closedness versus openness to new experience 0.91. Brief COPE inventory: The Brief COPE inventory (Carver, 1997) was used to measure participants' coping strategies. The Brief COPE is a multidimensional 28-item coping questionnaire that indicates the various ways in which people cope in different circumstances. The Brief COPE is scored on a four-point rating scale: varying from an intensity of 1 that represents 'I usually don't do this at all'. A statement with a value of 2 states 'I usually do this a little bit'. The third value represents a statement 'I usually do this a medium amount', while the fourth value reflects a statement of 'I usually do this a lot'. Descriptive statistics of the Brief COPE Inventory are displayed in Table 1. It seems that the factor structure does not replicate consistently from study to study (Bishop et al., 2001; Carver et al., 1989, Ferguson, 2001; Sica, Novara, Dorz & Sanavio, 1997). The four factors extracted in this study were: approach coping, avoidance, seeking emotional support and cognitive coping. Two studies (Mostert & Joubert, 2005; Pienaar & Rothmann, 2003) report reliability indices ranging between 0.83 and 0.92. Shirom-Melamed vigour measure: The Shirom-Melamed vigour measure (SMVM) (Shirom, 2003a) is used to measure vigour among participants. Vigour is viewed as a core affect attributed to one's work milieu (Russel, 2003; Shirom, 2003a). Descriptive statistics of the SMVM are displayed in Table 1. The SMVM is a 14-item paper-and-pencil self-report, seven-point intensity scale. The items in the questionnaire are set in a statement format. A value of 1 on the scale represents a response of 'Never or almost never', 2 represents 'Very infrequently', 3 represents 'Quite infrequently', 4 represents 'Sometimes', 5 'Quite frequently', 6 'Very frequently', and 7 represents 'Always or almost always' (Shirom, 2003a). During the validation phase of the SMVM an alpha of 0,94 was obtained with a sample of 2 743 employees (Shirom, 2003a). Armon, Shirom, Shapira and Melamed (2008) generated alpha coefficients between 0.92 and 0.98. A principal component factor analysis with a varimax rotation confirmed three underlying factors, namely, physical strength, emotional energy and cognitive liveliness. Shirom-Melamed burnout measure: The Shirom-Melamed burnout measure (SMBM) (Shirom, 2003b) is used to measure burnout among participants. The SMBM is a 12-item paper-and-pencil, self-report seven-point intensity scale. The questionnaire taps an individual's experience of physical fatigue, emotional exhaustion and cognitive weariness (Shirom, 2003b). Descriptive statistics of the SMBM are displayed in Table 1. The SMBM measures the opposite affective state of vigour, and is obliquely related to the latter construct (Cacioppo, Gardner & Brenston, 1999; Watson, Wiese, Vaidya & Tellegen, 1999). The items in the questionnaire are set in a statement format. A value of 1 on the scale represents a response of 'Never or almost never', 2 represents 'Very infrequently', 3 represents 'Quite infrequently', 4 represents 'Sometimes', 5 'Quite frequently' 6 'Very frequently' and 7 represents 'Always or almost always'. Shirom, Niriel and Vinokur (2006) report a 3-factor structure for the SMBM with reliability indices varying between 0.93 and 0.91. Participants were gathered in lecture rooms and invited to take part voluntarily in the study anonymously. The purpose of the study was explained to them prior to participation. Instructions were given verbally and no time limits were applied. Questionnaires were handed out to individuals in a booklet format. The researcher collected completed forms immediately after completion. After the data collection phase, the researcher checked the questionnaires for missing data. Those with missing data were omitted. The statistical analysis was carried out with the SPSS program (1998). Descriptive statistics and inferential statistics were used to analyse the data. The frequency distribution of the items was checked in order to assess deviations from normality and multivariate outliers were removed. Cronbach alpha coefficients (α) were used to assess the reliability of the measuring instruments; Pearson product-moment correlation coefficients were used to specify the relationships between the variables. The level of statistical significance was set at p < 0.05. The PROC CALIS computer program of the SAS Institute (2006) was used to establish factor models and the structural equation modelling (SEM) path models. Priori information of the developers, as well as follow-up research reports relevant to the instruments, were used to replicate factor structures. SEM is a statistical methodology that takes a confirmatory (i.e. hypothesis-testing) approach to the analysis of a structural theory bearing on some phenomenon (Byrne, 2001). A structural equations approach allows a model to be stipulated in advance of the data being examined (Hoyle & Smith, 1994). Table 1 displays descriptive statistics of the instruments. The means, standard deviations, scale minimum and maximum and Chronbach alpha indices are reflected. The results in Table 1 indicate that all instruments show acceptable Chronbach alpha coefficient values above the 0.70 guideline provided by Nunnally and Bernstein (1994). It is also noticed that the reliability index of the SMBM is the highest (0.95) with the Brief COPE reflecting the lowest index (0.86). Table 2 portrays Pearson correlations of the 21 subscales of the instruments. Inspection of the correlations suggests that some are significant at either p < 0.05 or p < 0.01, while several others are not significant on either level. Significant correlations indicate at least a linear relationship between variables, while those that are not significant have no linear relations. According to Howell (2008) insignificant correlations imply variable independence. When considering Bryman and Cramer's (2005) guidelines, police stress subscales (job demands, uncertainty, overload and frustration) produced positive modest correlations. Similarly, the SMBM produced low positive correlations. The SMVM produced low negative correlations. The main objective of this study was to determine how well the sample data fitted with the hypothesised Moos model by using SEM as a statistical method. SEM makes it possible to simultaneously estimate a measurement model (specifying relations between measured variables and underlying latent variables) and to specify structural relations among the latent variables. SEM has the flexibility to allow the researcher to model data structures which violate traditional model assumptions, such as heterogeneous error variances and correlated errors. In addition, software packages used to perform structural equation modelling, provided model fit indices which could be used to assess the fit of a hypothesised model to the sample data. In contrast with traditional regression techniques and exploratory factor analysis, SEM combines path analytic and factor analytic traditions into a single, unified representation. The strength of such a technique is that the effects of latent variables on one another, and on observed variables, can be assessed. Models assessed through SEM convey causal assumptions, although such models might not necessarily produce validated causal conclusions (Kerlinger & Lee, 2000). Information produced by Pearson correlations and the CFA on the subscales was employed to determine the number of parameters for the SEM in this study. In order to conduct the SEM, the Moos theoretical framework was simplified to set the path direction for the statistical exercise. Figure 2 is a path model to test relationships in the hypothesised Moos framework. The key to the subscales provided in Table 2 is applicable to the observed variables in Figure 2. According to the simplified hypothesised model (Figure 2), environmental factors (represented by stressors and social support) have an influence on psychological well-being. Coping has a mediating effect on psychological well-being, while personal factors may be a disposition in the coping process. Exogenous independent latent constructs as well as endogenous dependent latent constructs exist in every model. Endogenous independent latent constructs are represented by stress, personality and social resources. The exogenous latent construct is represented by well-being. Every latent construct is defined/measured by various manifested variables and represented by ellipses. Manifested variables are, according to convention, represented by a rectangle (Milsap, 2002). Except for a statistical significant index, SEM uses several global fit indices to determine model fit. There is no consensus on which goodness of fit indices should be considered in judging the adequacy of a model. However, there is agreement that SEM has no single statistical test that best describes the strength of a model's prediction and, therefore, more than one should be considered (Hu & Bentler, 1998; Milsap, 2002). Four indices were considered in this research. Firstly, the 'Goodness-of-fit' index (GFI) indicates the relative amount of the variances and covariances in the sample predicted by the estimates of the population. A value of 0.90 or above indicates a good model fit (Hu & Bentler, 1998). Secondly, to overcome the problem of sample size, Browne and Cudeck (1993) suggest the root square error of approximation (RMSEA). Values ranging from 0.05 to 0.08 are deemed a 'good fit'. The next two indices are probably most appropriate, for they evaluate a baseline model, as in this study (Hair, Anderson, Tatham & Black, 1995). The third index is the Normed Fit index (NFI) (Bentler & Bonnet, 1980) that has a range from 0.0 to 1.0, of which the latter suggests a perfect fit. The fourth index refers to the Non-normed Fit index (NNFI) (Bentler & Bonnet, 1980), also known as the Tucker-Lewis index (TLI) (Tucker & Lewis, 1973). The latter also ranges from 0.0 to 1.0, but can fall outside the 0-1 range (Hu & Bentler, 1998). As in the case of the former index, values greater than 0.90 are recommended for 'good fit' assumptions. The results of the path analysis (Figure 2) show an independent relationship between environmental factors and personal factors. Furthermore, weak negative relationships exist between environmental factors and coping (-0.051), as well as personal factors and coping (-0.008). A weak positive relationship (0.031) was reflected between coping and well-being. The vigour variables (emotional energy, physical strength and cognitive liveliness) loaded negatively, while the burnout variables (emotional exhaustion, cognitive weariness and physical fatigue) loaded positively. The above regression coefficients are statistically negligible; none were significant (p > 0.05). Several global fit indices were also produced, namely GFI = 0.78, RMSEA = 0.11, NFI = 0.68, and NNFI = 0.72. All of these indices indicated a poor fit. The research hypothesis is therefore rejected. The evaluation of the above model was of a confirmatory nature. However, with the costs involved to collect data, Byrne (2001) suggests that although no further modifications are usually made in strictly confirmatory approaches, the source of a misfit needs to be located and a respecification considered. When recalling that the factor loading estimates were substantial in magnitude and statistically significant, the source of the misfit must be elsewhere. Further attempts to maintain coping as a latent variable were rejected by the analysis program, while messages indicated that it was not possible in the initial path model. When inspecting the coefficients portrayed in Figure 2, one also notices that a local misfit centres in coping as a latent variable. Whereas coping was suggested as a mediating variable in the initial model, a respecified path model with direct effects was implemented. Coping was therefore omitted from further analyses. Figure 3 portrays a path model with 'police stress', 'social resources' and 'personality' as independent variables, with direct effects on well-being. Whereas police stress is positively associated with well-being (0.509), personality (-0.253) and perceived social support (-0.182) are negatively associated with well-being. Vigour loads negatively on the well-being factor, while burnout produces a positive loading. All the afore-mentioned loadings were significant (p < 0.05). Global fit indices were also produced, namely GFI = 0.82, RMSEA = 0.11, NFI = 0.77, and NNFI = 0.81. When comparing the initial path analysis (Figure 2) with the respecified model (Figure 3), it is noticed that all global fit indices show improvement, except for RMSEA, which stayed unchanged. Although the improvement in the respecified model does not meet a perfect fit, it occupies the middle ground between fit that is good enough to retain the model as specified and a fit that is poor enough to dismiss the model altogether. Milsap (2002) is of the opinion that SEM cut-off points are relatively arbitrary and may not be especially useful under large sets of measured variables, such as there were in this study. The respecified model has practical significance and would therefore be retained for future research. The objective of this study was to determine the goodness of fit between the hypothesised Moos stress and coping model on a sample of police officers. Confirmatory factory analysis confirms that the instruments used in this study are reliable and valid in measuring the constructs of police stress, perceived social support, Five Factor personality structure, coping strategies, vigour and burnout. These instruments provided parameter information in establishing the adequacy of fit to the hypothesised Moos stress and coping model on a sample of police officers. Pearson correlations between police stress (job demands, uncertainty, overload and frustration) and burnout (emotional exhaustion, cognitive weariness and physical fatigue) suggest a low-to-modest positive relationship between the underlying dimensions of these two variables. It means that if stress increases, burnout may also increase. The latter is supported by previous research conducted in a police context (Rothmann, 2003; Rothman & Jorgensen, 2007). Dimensions of vigour (emotional energy, physical strength and cognitive liveliness) suggest a low negative relationship with the police stress dimensions. Such a relationship is rather of practical significance and suggests that when stress increases, people might not be very energetic in their daily psychological functioning. This finding is supported by research conducted by Shirom (2003a, 2003b). Correlates between vigour and burnout also suggest a low-to-modest negative relationship. This is a bivariate relationship, supported by previous research conducted by Shirom (2003a, 2003b). The one is a mirror image of the other. The Five Factor dimensions (introversion-extraversion, antagonism-agreeableness, neuroticism and openness to experience, lack of direction - conscientiousness) produced insignificant relationships with those of police stress (job demands, uncertainty, overload and frustration). This means that stress levels and the personality traits do not have any effect on each other. However, the neuroticism subscale produced a very low positive relationship with police stress. In addition, higher stress levels may lead to psychological instability. Larsen and Buss (2005) support these findings. They found that neuroticism among police officers reflects some levels of psychological instability when working under high stress levels. Avoidance coping suggests a very low positive relationship with job demands and overload, as well as neuroticism. It is assumed that police officers scoring high on neuroticism would alienate from high workloads. Although a direct link between avoidance coping and personality dispositions is hard to find in literature, a study (Lepore, 1995) conducted in the 1990s revealed that people who scored highly on the neuroticism scale may find it difficult to form personal relationships. In the same vein, Anshel (2000) found that police officers who are using avoidance coping strategies, also tend to use other maladaptive strategies, such as drugs, alcohol and overeating. It further means that such individuals are not productive contributors to the workforce. Larsen and Buss (2005) assert that individuals who score highly on the neuroticism scale have a rather negative, or pessimistic outlook toward their work environments. A further assumption is that such individuals might use avoidance coping strategies. The Pearson correlations also suggest a low positive relationship between seeking social/emotional support and friends, family and significant other. These results are supported by findings of Carver et al. (1989), which state that people who score highly on the support seeking subscales have a strong need for support by those with whom they interact on a daily basis, for example their children, spouses, friends, colleagues and supervisors. When inspecting the correlates provided by the instruments, one notices that the vigour dimensions (emotional energy, physical strength, cognitive liveliness) reflect a low positive relationship with perceived social support (friends, family, significant other), as well as with personality traits (extraversion, agreeableness, conscientiousness, openness to experience). Conversely, vigour suggests a low negative relationship between neuroticism and avoidance coping strategies. The above results support Shirom's (2003a) findings that energetic individuals usually score high on extraversion and deal positively with day-to-day challenges. Such individuals would rather use approaching coping strategies. In addition, people who feel vigorous or energetic may generate a particular thought-action repertoire that expands activity, broadens the range of options and promotes creative solutions to work related problems. Similarly, leaders who score highly on vigour also reflect an energetic leadership style that energises followers. Results in Table 2 reflect a low negative relationship between burnout (emotional exhaustion, cognitive weariness and physical fatigue), perceived social support (friends and family), personality (extraversion, agreeableness, openness to experience) and coping strategies (seeking social/emotional support). Simultaneously, burnout suggests a low positive relationship between neuroticism and avoidance coping. The above results are confirmed by other studies (Schaufeli & Buunk, 2003; Semmer, 2003), which propose that individuals who suffer from burnout may disengage from social and work relationships, and therefore would necessarily avoid interaction, irrespective of whether it is in a social or work context. These studies assert that group cohesion is negatively affected and managers may find it difficult to manage teams or groups. In the same vein, Saucier and Goldberg (2002) found that individuals who had high scores on neuroticism tended to have low self-esteem, would avoid social or work interaction and were vulnerable to severe stress outcomes. It seems that individuals scoring high on extraversion, agreeableness, and openness to experience might be less vulnerable to severe stressors. The aim of this research was to establish whether the sample data fit the Moos hypothesised model adequately. The path analysis produced a very low, negative insignificant coefficient between environmental factors (police stress and perceived social support) and coping on the one hand, and a very low, negative insignificant coefficient between coping and personal factors (personality) on the other. In addition, the analysis produced a very low insignificant coefficient between coping and psychological well-being (vigour and burnout). Although cut-off points can be set arbitrarily (Hair et al., 1995), fit indices produced by the analysis exceed those suggested by authors. The research hypothesis is therefore rejected. The results are in contradiction with the Moos model because coping as a mediating latent variable is omitted by the analysis. Du Toit (1999) however, found a fit by means of the same Moos model, with some mediating effects. Although she suggests a model respecification, her findings propose that psychological well-being is mediated by social resources and coping strategies. Furthermore, personal factors may influence psychological well-being via cognitive interpretations and appraisal that influence the selection of coping strategies. The latter study produced a RMSEA fit index of 0.08, which suggests a good fit. It should be mentioned that Du Toit (1999) employed different instruments and the sample relates to university students. While this study followed a pathogenic, as well as a salutogenic (positive psychological), approach when defining well-being, Du Toit's study defined it only in terms of a salutogenic approach. Although the respecified path model (Figure 3) did not produce an excellent global fit, it was an improvement on the initial model whose usefulness should not be ignored (Milsap, 2002). The respecified path model suggests significant direct effects. Inasmuch it was expected that the initial model produces mediated effects, the respecified model suggests a modest, positive and direct effect between stress and well-being. Coping was omitted in the respecified model, maybe with reason. Several researchers (Antoni et al., 1991; Carver et al., 1989; Folkman & Moskowitz, 2000; McCormick, Dowd, Quirck & Zegarra, 1998) are convinced that coping strategies are actually an extension of personality traits and have an influence on well-being. Therefore, coping strategies may have been contaminated by personality, or vice versa. Furthermore, passive coping, which is prevalent among individuals suffering from burnout (see Pieterse et al., 2007), did form part of the study. If passive coping, which implies feeling unable to undertake action and isolating oneself from others, was added as a dimension of coping strategies, the initial model could have produced different results. During further investigation of the respecified model, one notices that vigour loads negatively, while burnout loads positively on well-being, a latent variable. In addition, the model suggests a low negative and direct association between personality and well-being, with a similar association between social resources and well-being. The effects proposed by the respecified model would have several implications for police officers. When stress is high and prolonged, one can expect that people may suffer from burnout. The latter has been confirmed by several studies (Pienaar & Rothmann, 2003; Shirom, 2003b; Stevens, 2005). It further seems that personality and social support do not have a mediating effect when officers experience burnout. Instead, the respecified model suggests that personality and social support have a direct negative effect on well-being. Conversely, personality and social support could encourage energetic or vigorous individual functioning among those officers who experience low energy levels, or face tasks of a challenging nature (e.g. that require innovation, imagery or problem solving skills). Previous research (Halonen & Santrock, 1997; Shirom, 2003a; Worline, Wrzesiewksi & Rafaeli, 2002) supports these research findings when stating that emotional energy (a dimension of vigour) is a specific and long-term emotion that is the main motivating force in social and organisational life. It is also an important element of effective coping. Is this why motivated people reflect an excessive amount of energy that is sufficient to deal with day-to-day activities? As far as personality is concerned, researchers (Brief & Weiss, 2002; Maslach, Schaufeli & Leiter, 2001) found that individuals who respond highly on extraversion (or positive affectivity) are more likely to experience an energetic or vigorous life relative than those who respond highly on neuroticism. Individuals responding highly on the neuroticism scale would then be vulnerable to prolonged stress. The fact that the instruments were originally developed in the English language has proven to be a limitation of the study. The English literacy under local conditions is under suspicion and may have limited the value of the study. The cross-sectional nature of the design made it difficult to prove causal relationships. Another limitation was the exclusive employment of self-report measures, a strategy often associated with method variance. Sample size further limited the research results in such a way that results could not be generally applied to all police officers in South Africa. A few recommendations emanate from this study to improve police officers' health. Firstly, the embracing of support systems within a police context would create a healthier police corps to serve the community in a more, effective manner. Police management should be aware of the negative health consequences of prolonged stressors and react proactively. Job redesign is one technique to reduce burnout's negative effects (Shirom, 2003b). Secondly, transformational leaders should be identified to manage work teams or groups with high stress potential. Such a style embraces vigour indirectly by means of idealised influence, inspirational motivation, intellectual stimulation and individualised consideration (Avolio, 1999; Shirom, 2003a). For example, individualised consideration encourages employees into a higher level of perceived social support, while inspirational motivation is likely to enhance followers' self-efficacy and intellectual stimulation. Thirdly, another possible option is to improve individuals' learned resourcefulness. According to Akgun (2004), learned resourcefulness is a cognitive skill that can be acquired; it increases one's perceived self-efficacy in control of emotional responses, the application of problem-solving strategies and the delay of immediate gratification. With regard to future research, it is recommended that both path models be evaluated with different and larger samples. Even longitudinal designs should be considered in the investigation of causality. In addition, a modification of some of the measures could be considered. For example, passive coping as a subscale can be included in the Brief COPE instrument to assess its prevalence in burnout samples. Such a limitation creates an opportunity for South African researchers to adapt the instruments, which were predominantly used internationally, to local conditions. Alternatively, the existing measures could be replaced with new ones. The results in this study are not usual, when one looks at other studies (e.g. Milsap, 2002) - especially when considering the number of observed and latent variables involved. However, this study contributes to an understanding of the stress and coping process in a police context that is probably over-simplified in the Moos model. For example, this research revealed that social resources influence well-being independently, instead of collectively, with environmental stressors, as suggested in the Moos postulate. Similarly, personality influences well-being independently, instead of via a mediating variable, as suggested in the Moos model. When considering the practical implications unveiled in the study, some conclusions and recommendations can be made in support of the research. It can be concluded that police officers indeed experience negative effects from prolonged stressors relevant to the work environment. Such stressors consequently may inflict permanent negative health consequences. The respecified model confirms that some officers experience burnout, but, paradoxically, others continue unaffected as a result of some resilient factors not revealed in this study. Finally, it can be assumed that police officers do not operate in isolation and therefore require social support systems within organisations, as well as in a social context to reduce the effects of stress outcomes.